Home » BootCD » Disztribúció » GNU » Hobbi » Kernel » Linux » programok » repó » Wikipédia oldal » Linux From Scratch! Hogyan építhetsz teljesen a nulláról egy saját linux disztribúciót? A válasz az LFS projekt weboldalán található! Welcome to Linux From Scratch! Linux From Scratch (LFS) is a project that provides you with step-by-step instructions for building your own custom Linux system, entirely from source code. 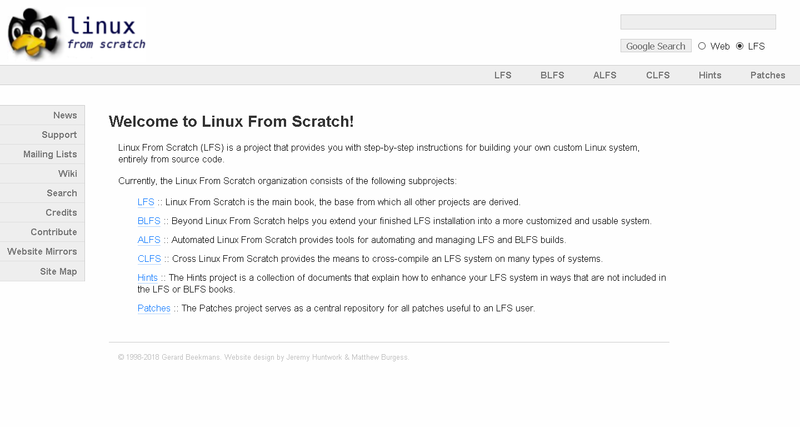 LFS :: Linux From Scratch is the main book, the base from which all other projects are derived. BLFS :: Beyond Linux From Scratch helps you extend your finished LFS installation into a more customized and usable system. ALFS :: Automated Linux From Scratch provides tools for automating and managing LFS and BLFS builds. CLFS :: Cross Linux From Scratch provides the means to cross-compile an LFS system on many types of systems. Hints :: The Hints project is a collection of documents that explain how to enhance your LFS system in ways that are not included in the LFS or BLFS books. Patches :: The Patches project serves as a central repository for all patches useful to an LFS user.